For some time we have been purposefully calling this ‘Project IX’. This was done to prevent us defining the project before it has really started up. We also thought that you all might have some thoughts on the matter. Hence, we’re asking for suggestions for a name for Project IX. What we’re not going to call it is ‘Star Formation Zoo’. That is one of the names this project has had internally, but we don’t like it. Sure, Project IX is essentially a Zoo about star formation but this doesn’t feel like a good name. In fact, it doesn’t have to be a ‘zoo’ at all. Solar Stormwatch and Project VII don’t have ‘zoo’ in the title… but I can’t talk about that. If you have any ideas on what we can call Project IX, we’d love to hear them. Please leave suggestions in the comments below and we’ll start collating them. If a consensus cannot be reached, we can try a vote of Zooniverse users. Anyone can suggest a name, so if the science team is reading this, feel free to pitch in as well. UPDATE: After letting the comments run for a while it seems that ‘Milky Way Zoo’ and ‘Stellar Zoo’ are the two more popular names. So here’s a poll – which name should we pick? 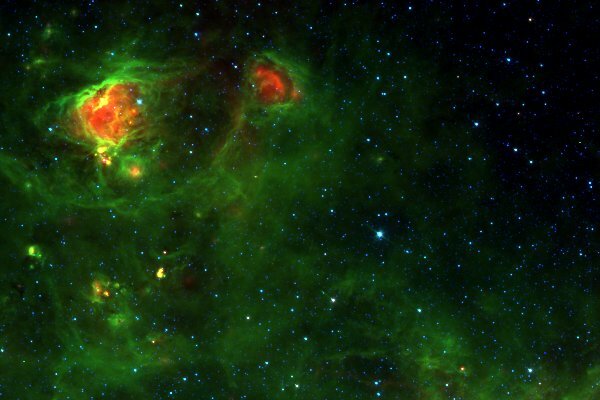 Some of the most beautiful structures in Spitzer GLIMPSE data are the bubbles. 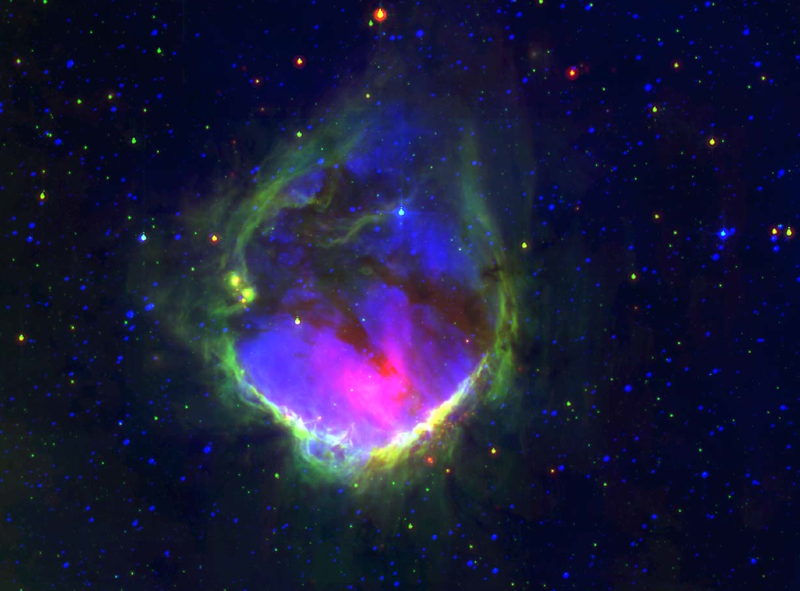 Bubbles are regions of gas, usually found around newly formed stars, often with shells of material surrounding them (the green 8 μm emission above). These appear as rings in the GLIMPSE images and can vary in appearance from strikingly prominent to intriguingly faint. They can be anything from complete circles and ellipses, to fractured, fragmented remains. As part of Project IX we’re going to ask you to find and measure these bubbles. Researchers can use this information to learn a lot about how these objects form and how they trigger star formation. Above is an image of RCW 120, the titual “perfect bubble” from a 2009 paper by Deharveng, Zavagno, Schuller, Caplan, Pomarès and De Breuck. This colour-composite image shows Hα emission in blue, 8 μm emission in green and the 24 μm emission of small dust grains in red. The image is approximately 24′ degrees wide. 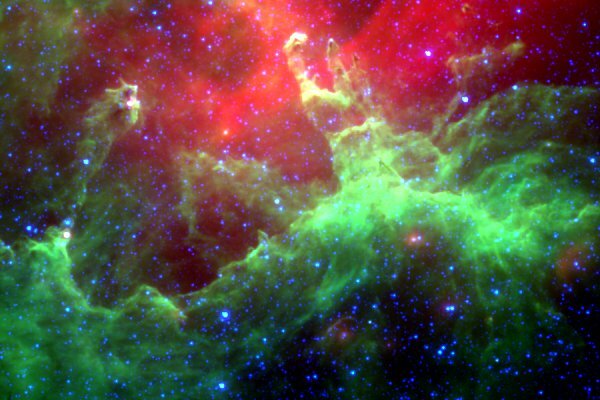 The green material has been swept up as the region expanded, after the formation of a massive star in the centre. There are about 2000 Solar masses of neutral material here, and this has fragmented into lumps. This is where star formation is occurring. The authors of the study found 138 potential star-forming objects in the ring around RCW 120. The study of bubbles gives information about the stellar winds that produce them and the structure and physical properties of the ambient ISM – interstellar medium – into which they are expanding. Additional physical insights include the hydrodynamics of gas and dust in expanding bubbles, the impact of expanding bubbles on magnetic fields in the diffuse ISM, and mass-loss rates during the evolution of stars. In 2006 322 bubbles were visually identified by just a handful of people. Since that time two things have changed. Firstly, there is now a lot more data, and therefore more bubbles. Spitzer has also continued to map more of the galactic plane for the GLIMPSE360 project – more on that in a later post. Secondly, the Zooniverse now exists! Everytime the Zooniverse and bubbles have been mentioned together, someone has been there saying that we should get the public to find and measure them. Whether this is between Chris, myself and others at Zooniverse HQ or between Grace Wolf-Chase at Adler Planetarium and various members of the ‘The Bubbling Galactic Disk‘ study. Bubbles and the Zooniverse should be a match made in the heavens. Why are bubbles such a good target? For many reasons. They are not only amazing to look at, but also are numerous in the GLIMPSE data. They are tricky to measure but not impossibly hard. They are scientifically valuable objects to catalogue and measure the properties of, and they require more than one independent, human measurement to get a good handle on – this is key of course. Many of the folks behind the ‘The Bubbling Galactic Disk‘ are part of the Project IX science team. We hope that everyone out there in the Zooniverse community can help refine and expand the existing bubble catalogue as part of Project IX. With the addition of new data, we also hope to find many new bubbles. We are currently developing the bubble tool – the first user interface portion of the Project IX site – which will have similarities to the Moon Zoo crater tool. We hope to be able to share it with you all soon so that you can help us to test and refine it. It is exciting to be able to involve everyone at this early stage. 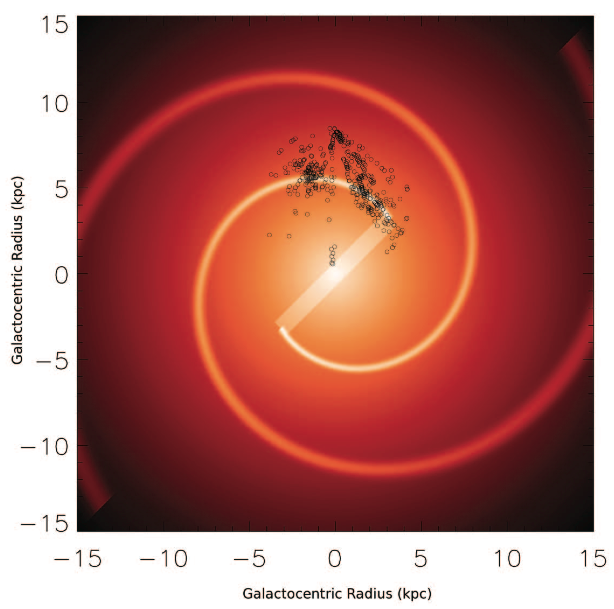 If you’re interested in following this project and its take on bubbles, I’d suggest reading ‘The Bubbling Galactic Disk‘ and looking at the GLIMPSE website. If you have any questions – let us know. Bubble are just one thing we can see in the GLIMPSE data. More posts will follow about other scientifically useful objects lurking in this amazing infrared archive. 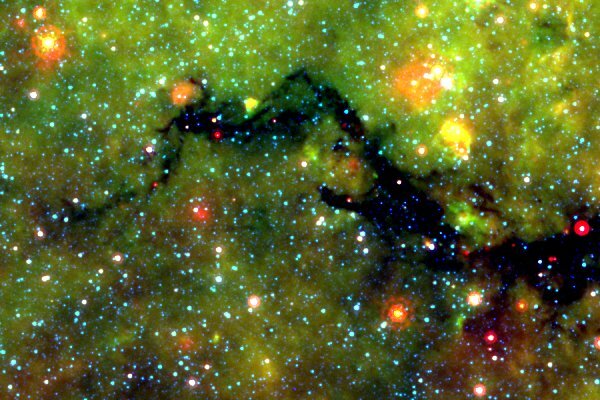 A current hot topic in star-formation science is the study of Infrared Dark Clouds (IRDCs). These are really dense molecular clouds that appear dark even in infrared surveys. For a while, we hoped that Project IX would be our avenue to exploring IRDCs. However, as you’ll see in this blog post, not every idea become a reality at the Zooniverse – for a good reason. Here’s the story of the IRDC project that never was. IRDCs appear throughout images from far-infrared surveys – there’s a lovely example in the image above. It was not initially known what lay within them. Closer study revealed that they have sizes and masses similar to high-mass star forming molecular clouds. Similarly, the dense cores within IRDCs appear to match the sizes and masses of high-mass prestellar cores – the direct progenitors of stars. IRDCs also seem to be located along the spiral arms of our Galaxy, which is where star formation mostly occurs (Jackson et al, 2008, see image below). A few IRDCs even show evidence that they contain young proto-clusters of stars. In short, evidence seems to suggest that early phase high-mass star formation is occurring within IRDCs. High-mass star formation is another hot topic in astrophysics. It is not fully understood how stars several or hundreds of times bigger than the Sun form. We know that they do and that they can get really big – but compared to the process of low-mass star formation their origins are a bit of a mystery. IRDCs may hold some answers. It has been established that there are upward of 10,000 IRDCs visible to us here on Earth (Simon et al. 2006a). For each of these it would be useful to know their size, shape and location. The Spitzer Space Telescope’s Galactic Legacy Midplane Infrared Survey Extraordinaire (GLIMPSE) highlights many of these often beautiful dark clouds and the data is available for use. The question is how do you visually classify this many dark clouds in such a large dataset? This started to sound to me like a potential citizen science problem. Lots of objects to be found, a task that computers find difficult, and a large dataset. We got really excited here at Zooniverse HQ, and began to concoct an idea that would see tens of thousands of volunteers literally painting clouds in space. I developed a prototype HTML5 interface that allowed someone to draw around IRDCs in GLIMPSE data (se image below). Sadly, our enthusiasm wasn’t to last. We had a prototype interface and we had lots of GLIMPSE data – but Chris was worried. I kept bringing him a new developments and he’d be interested, excited but also cautious. So we sat down to really get to the bottom of this idea. Imagine 1,000 people were to draw around the same IRDC in an image. Each person looks at the image and decides in their own mind where they would say the border between the dark cloud and the surrounding bright emission is. They then draw around the cloud, fairly imperfectly, following roughly that ratio of dark-to-light. Translating this into a different vocabulary: each person decides on a contrast ratio and tries to follow a fixed-contrast contour around the dense region in the image. We then average those contours to get the group’s decision on the best contrast ratio to use. Have you spotted the problem? The average contrast ratio achieved by this method is no more right or wrong than any other value. 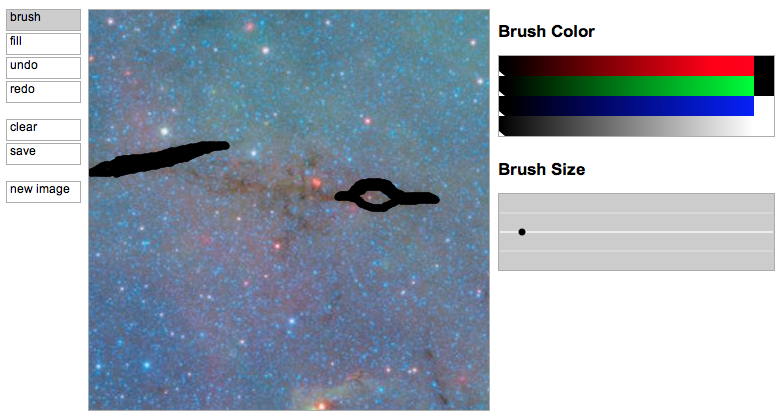 You may as well have taken a computer and told it to draw a contour at a specified contrast ratio across the whole Galaxy. You can derive that ratio via some meaningful number that can be calculated from the data – maybe the extinction or the signal-to-noise. The 2006 paper that identified the Galaxy’s 10,000+ IRDCs already did this – instead of improving upon the existing study, we would have ended up replicating it, only in a slightly different way. We compared our own visually identified clouds to those drawn out by the Simon et al., 2006 algorithm and found the results were very similar. As such the cloud painting project was more-or-less concluded there and then. The Zooniverse has policies on what makes a good citizen science project. These guidelines have been produced following the lessons of Galaxy Zoo and other projects. Chris wrote up a blog post about this the other day. Our one unbreakable rule is that if we ask the public to collaborate on a project, their efforts must produce a meaningful result. We must never waste people’s time. I’ll be honest, I was a bit gutted. Cloud painting would be possible and it would yield a reasonable result. It would even be fun! However it wouldn’t add anything scientifically useful to what we know about the Galaxy’s IRDCs. Just because a problem can be crowd-sourced doesn’t mean it should be. Luckily for Project IX, there is a lot more to see in the GLIMPSE data than just IRDCs. So we leave the dark clouds to the machines and in our next post we’ll finally talk about the great science that we can achieve. If you want to learn more about IRDCs there are lots of papers and talks on the subject out there on the web. If you’d like to read some of the papers here’s a potted history of IRDCs – Simon et al. 2006a; Rathborne et al., 2006 and 2007; Simon et al., 2006b; Jackson et al, 2008and Chambers et al., 2009.